The Suburban Style Life: Weekend, etc. We had a great weekend! On Saturday, I had several of my college friends over for a get-together. We usually rotate our houses every month or so. This month was mine so I was working my little tail off trying to get our house ready for our guests. Most of my friends have one and two year old's so they were running all over our house. It was pretty entertaining and I definitely got a good look to what I would need to baby proof in our house if we were planning on staying here. Luckily we are not!!! Even though we had a busy weekend with guests, Jeff still was able to finish the second coat on the master bedroom bathroom. It's really coming along. We now only need to install a bathroom cabinet and the baseboards. 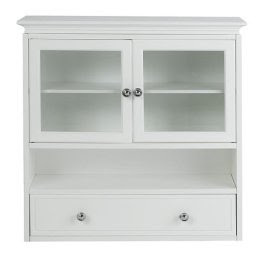 I really like this cabinet from Target, however, the internet ratings on the Target.com website were not all that great. I checked other places like Lowes, Wal-Mart, Home Depot, etc, and this one was by far the cutest and the best price. To get or not to get? I would love your feedback so let me know!!! Have a great week! !